If you have a child or grandchild (aged 7-10) who needs to be prepared for First Communion and Confirmation, please, remember that one parent must accompany the child in the program. This two year program is every Sunday morning at 9:45 am at St. Elizabeth’s under the direction of Carla and Jim Fretwell. The group joins the congregation for Eucharist at 11 am. If your child or grandchild is older than 10 and has not yet received the Sacraments of Reconciliation (confession) or Confirmation it is important that they journey with other older children in preparation. This program is also at 9:45 am at St. Elizabeth’s - see Stasia Hartley. 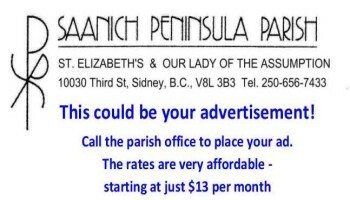 Saanich Peninsula Parish provides support for families in teaching their children about spirituality, God, and their role in the Christian community through Religious Education classes and home support. The Bishop, together with a committee, modified the sacramental (confirmation and first communion) preparation program into a two year program. There are several reasons for this. Depending on parental and family involvement today’s children have sometimes little religious knowledge. Both children and parents felt “rushed”. A need was seen for a longer and fuller preparation which could better prepare both the children and the parents for receiving these sacraments of initiation. What is different is that at least one of the parents is asked to accompany their child on that journey by participating in the program. At the end of each Sunday's program (11:00am), the children and participating parents will join the rest of the community at offertory time in order to continue the celebration of the Eucharist. The community, as a whole, participates in the journey by having listened and reflected on the same Word of God proclaimed. This year will be an exciting time in our parish as some of the children together with their parents will be preparing for Confirmation and First Communion. We are accepting registration for kids aged 7 to 15 years old. Registration forms can be downloaded here and will be available in the foyer after mass at St. Elizabeth's. The registration fee is $25 per student up to a maximum of $50 per family. The classes start at 9:45am on Sunday, beginning with a brief gathering in the church, and will run until 11:00 am when the children, and any adults accompanying them, will enter the church to join the congregation immediately following the homily.